This afternoon we wrapped up week six of our nine-week spring semester with Journeyman certification testing on axemanship and dramatic thunderstorms. As part of our Journeyman certification, students have to pass a series of tests in the field to demonstrate their mastery of the material. Today we tested on the four major axe disciplines: felling, limbing, sectioning and splitting. Everyone passed, which made me feel good for the hard work they’ve put in and good about our teaching process. As an educator it always feels good when your students get it. 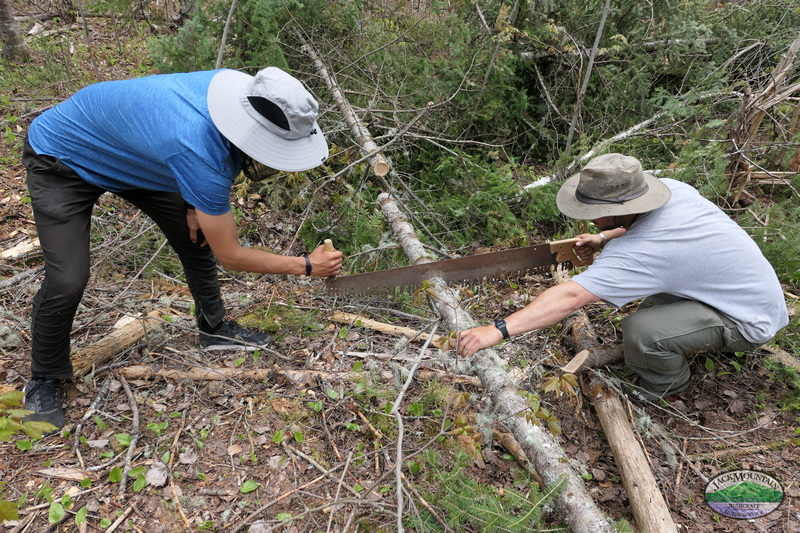 We also covered the use of a one and two person crosscut saw as demonstrated in the photo above, and finished out the afternoon carving netting needles and making nets. We’re six weeks in with three to go. The fiddleheads are coming up and the trout (and black flies) are biting, and there’s nowhere I’d rather be.